I was also inspired by the logo of a new stamp company called winnie and walter - I'm eagerly awaiting my opportunity to shop! This Stampabilities sentiment (that echos Therese's sentiment with its handwritten feel and mixed fonts) is one of my favourite Christmas presents from this year - my mom found it for me at Hobby Lobby during one of her trips to the US. I just loved the handwritten feel of it when I saw it on this Muse card of Benzi's and went frantic trying to find it online, to no avail. I showed it to my mom online and she promised she would keep an eye out for it but then I forgot all about it until I opened it on Christmas day. Moms are great, aren't they? And now, here I am using it on my Muse card! OOH this took my breath away at the loveliness!!!! Oh yes...this is super fun...love it Ardyth. And the font is fabulous! Love your take on Therese's card! I'm always amazed by what you come up with for a card after seeing an inspiration. I'm glad your Mom found the stamp. Fabulous card, Ardyth! I don't know how you do it, but you nail it every, single time!!! Oh my goodness...this is just incredible. I love it!!! Absolutely gorgeous! The colors are sooooo perfect together! I looked at the cupcakes and saw calories! You looked at the cupcakes and saw colored trees! You amaze me...AGAIN! That stamp....um....beyond fabulous! The 'print writing' really is unique! Gonna have to send my sister on a mission next week when she is in Hobby Lobby! 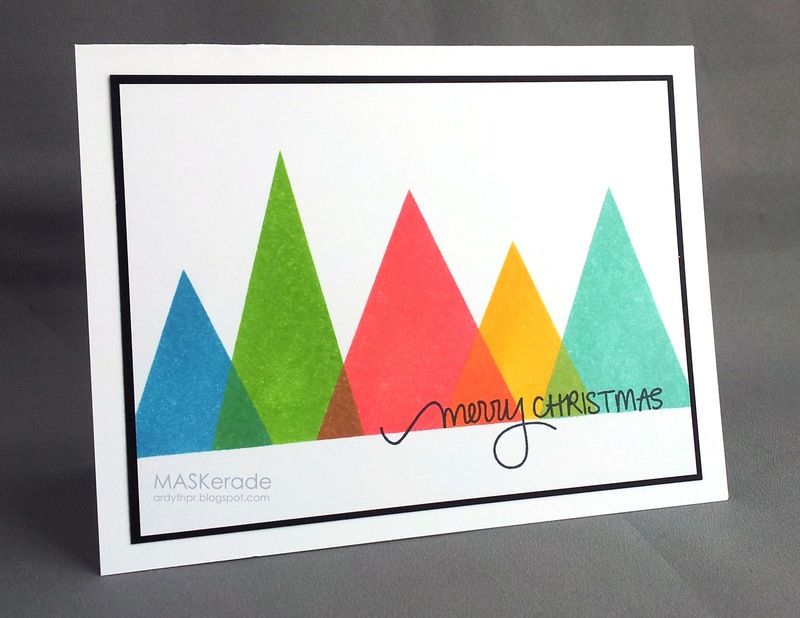 AWESOME cool and funky graphic Christmas card!! Love it! And that font is fabulous - go mom! This is totally awesome! LOVE it!!! This is fantastic. Love those triangle trees and how they overlap just a bit. And, that sentiment is just perfect--love how just a bit of it goes below into the white. Yay mom--she's a keeper. What can I say Ardyth... ALWAYS and inspiration!